Caller: "One of the great calamities in sport was when Justin Madden kicked the post." KB: "That was Percy Jones." Guess the bloke was confusing Justin Madden the footballer with Justin Madden the former Victorian ALP minister for Calamities. "We need to take a bucket of cement and man up." A TOP psychologist has warned that fans who watched last night's Packed to the Rafters episode could experience grief. "The death of a favourite character could cause a genuine sadness, which requires grieving," psychologist Jan Hall warned. "Viewers who are attached to the storyline could identify as if the characters are real people. Tell yourself it's only a TV show, exercise to release the 'happy drugs' in your body, or watch a soppy DVD that makes you have a good cry. Viewers could also write a farewell letter to the character and thank them for the great times they had with them." Write a farewell letter to reality, more like. A BIT of monkey business by Hamish and Andy at Werribee Zoo left one family feeling cheated. They thought they were watching the real thing. The hit comedy duo donned gorilla suits for a TV sketch in which they played with a remote-controlled car and a golf club. Michal Pecek, who visited the zoo on Saturday with his children and friends, thought he was watching an authentic pair of jungle primates. It was only after arriving home that Mr Pecek zoomed in on his photos and discovered they were phonies. "I go there to see animals, not actors," he said. "Most people who were there on Saturday believe they are amazing, smart gorillas." The Southbank father can't bring himself to tell children Oliver and Michaela the gorillas weren't real. He said he felt "deceived". "I was taking pictures of the gorillas and said: 'It's amazing they are playing with the remote-controlled car'. "They managed to do some amazing stuff - holding a golf club and so on. People were looking at them and laughing and enjoying it." Even when you write that stuff, you can't write that stuff. What's French for cherchez la femme? Japanese man Hiroo Onoda continued to fight his own gorilla war for 29 years after World War II, refusing to believe the fight was over. 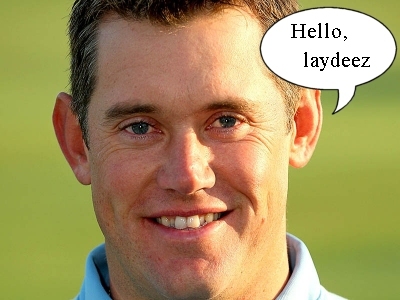 Keen to gauge a gender specific reaction as to whether new No.1 Lee Westwood will attract quite as much attention vis-a-vis the contradictory gender as his predecessor, I asked our secretary what she thought about the picture on the left. TT: "Nik, what's the very first thing you think of when you look at this bloke?" Nik: "He looks like a golfer." The 57-year-old performer drove her navy Toyota Vienta through Wink Optometrists on Ormond Rd at about 6.30pm. Josef Fritzl says his favourite show to watch on TV in his cell is Two And A Half Men because the teenage boy in the show reminds him of his son. Surely Fritzl should be kept in a cellar, not a cell.